Sick of boring, bland lunches at work? 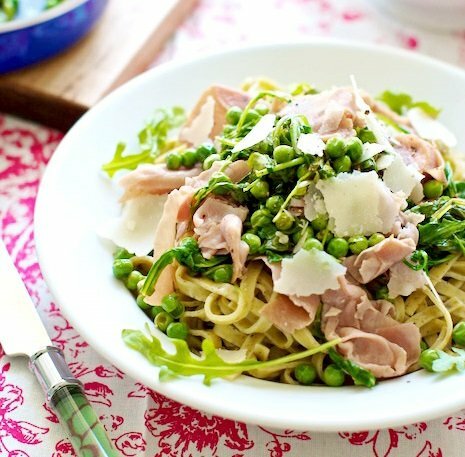 These 7 delicious lunch recipes will spice things up without causing chaos in your diet. Lunch is the bane of many people trying to follow a proper meal plan (especially those working at losing fat), and particularly for those that are on the go. Restaurant food poses the problem of never really knowing how many calories are in the meal, and many DIY options are less-than-exciting. Well, in this article I want to give you 7 healthy lunch recipes that you can prepare in your spare time and then stash in a container and keep in the break room fridge if you’re at an office or a meal bag like this from 6 Pack Fitness if you’re on the go. The first week or two it could feel tough to get the habit going, but once this becomes routine, the feeling of having a healthy lunch on hand instead of zipping through the drive-thru to wolf down a greasy burger and fries in your car will be worth the effort you put into the preparation. 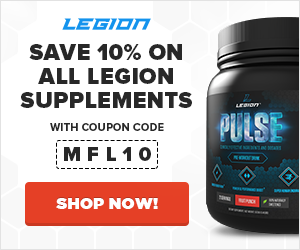 Looking for a simple way to get more protein in your diet? Cottage cheese is in any top ten list of sources of whole food proteins, but not everyone enjoys eating it with a spoon. 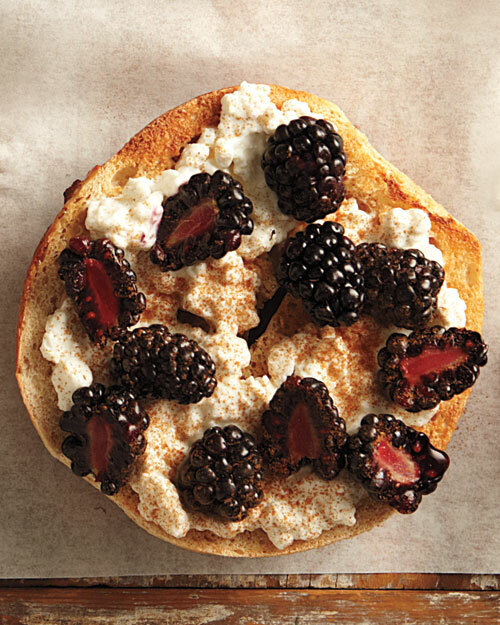 Add a bagel and berries in the mix, however, and it’s hard not to like the creamy soft cheese. To further mask the flavor, make this a grown-up version of PB&J by spreading on a tablespoon of roasted almond butter before adding the cottage cheese. 1. Toast one half of a whole-wheat bagel. 2. Top with cottage cheese and blackberries. 3. Finish with a drizzle of honey and dash of cinnamon. 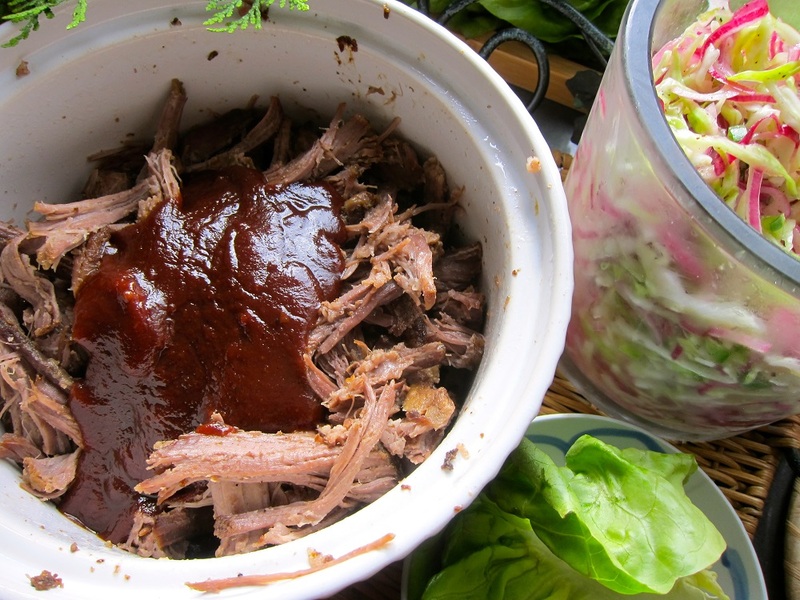 If you make a pound of meat in the crock pot or Dutch oven, you’ll be eating for days. Repurpose some pulled pork for these quick, protein-packed lunches. 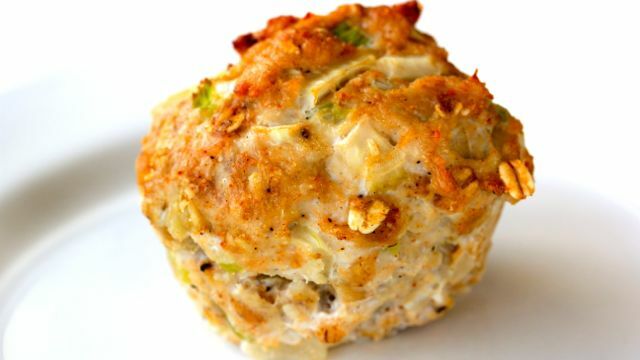 The ultimate way to use up leftovers, this recipe is easy to adapt to any veggies or condiments that you have to use in the fridge. No matter how you make them or where you choose to eat them, don’t forget to bring along plenty of sriracha. 1. Whisk together scallions, ginger, sesame oil, soy sauce, sherry vinegar, and salt. Pack 1/4 of the sauce in a small, airtight container. 2. In a rectangular airtight container, lay out two lettuce leaves, and top with 1/4 cup of the shredded pork and 1/8 cup cabbage. Cover, and keep in the refrigerator until ready to go. Now you have a lunch ready for one! 3. Repeat for three more servings, or store the rest in the fridge until ready to assemble. This cold salad is delicious on its own, but it also makes a great side dish for leftover chicken. Slice up grilled or baked chicken breast, and place it on top of the to-go bowl for a super satisfying lunch. 1. Rinse the quinoa under cold water for about 2 minutes, and drain. Heat a large saucepan over medium heat to briefly toast the quinoa, just until it begins to brown. 2. Add 1 1/2 cups of water to the saucepan, and turn the stove to medium-high. Bring to a boil, cover the pot, and cook quinoa for about 15 minutes. Remove from heat, and let stand – still covered – for 5 minutes until all liquid has been absorbed. Fluff quinoa with a fork, and set aside. 3. Heat 1 tsp. olive oil in a large skillet over medium-high heat, and add the chopped kale to the pan. After a minute, flip, and continue cooking for another minute. It will be finished when just starting to wilt; at that time, move it to a large bowl. 4. Blend all salad dressing ingredients together, or shake to combine in a covered container (such as a mason jar). 5. 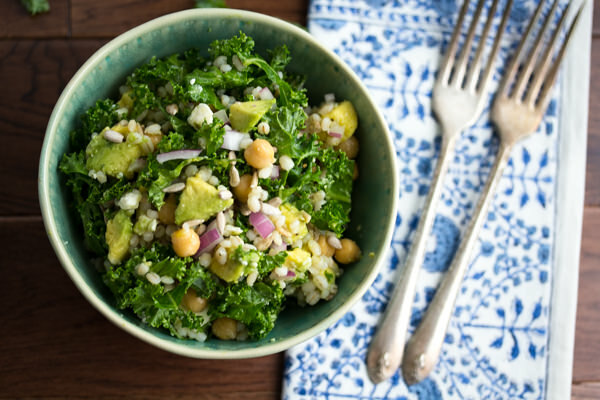 Add garbanzo beans, red onion, and feta to the bowl with the kale. Drizzle the dressing over the top, and mix well to coat. Stop before you peel back the top of that fruit-on-the-bottom yogurt. Chances are it’s loaded with carbs. 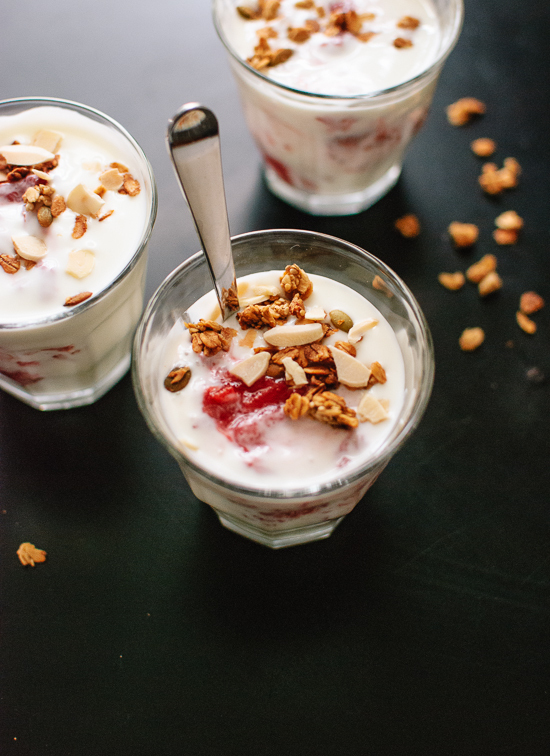 If you want to enjoy yogurt, it’s better make your own parfait and control the amount of sweetener (and thus calories) added. Yogurt can be dressed up in countless ways, but this simple mix of spring flavors is perfect this time of year. If you need a more filling lunch or snack, bring a baggie of your favorite granola to mix in. 2. Spread the strawberry and rhubarb slices onto the baking sheet, and coat with honey. Bake for 10 minutes, toss to turn, and continue cooking for another 10 to 15 minutes until the pieces are tender. 3. In a medium bowl, mix the strawberries, rhubarb, and lemon juice. Let cool. 4. In a separate bowl, blend together the Greek yogurt and whey protein. 5. Layer the yogurt and fruit together in a portable dish. Cover, and keep in the fridge until ready to take your parfait on the go. These portable meals are full of everything you need midday: ground turkey, egg whites, oats and a little celery for good measure. If you want to keep lunch simple (and don’t get bored easily), pack two, and you’re good to go. Or, these are great to pair with your favorite snack: a handful of nuts, baby carrots, roasted pumpkin seeds, a side salad, or one ounce of cheese. 1. Preheat the oven to 375°F. Then, either place foil liners in a standard 12-cup muffin pan, or spray with olive oil. 2. In a large bowl, mix all ingredients together using clean hands. Roll the mixture into balls about 2” in diameter, and put each one in a muffin liner. 3. Bake for about a half hour, until the muffins are cooked through and beginning to brown on top. This dish looks downright fancy, but the hardest thing about making it is cooking the pasta! It isn’t even difficult to shop for because it requires less than 10 ingredients – and that includes olive oil, salt, pepper, and pasta, which are staples found in any pantry. You can spoil yourself by making this pasta salad for a week of to-go lunches, but you should also keep this make-ahead recipe on hand for when you’re entertaining guests. 1. Boil a large pot of salted water, and cook the pasta according to the time on the box. Drain, and set aside. 2. Trim the edges of the prosciutto to remove visible fat, and chop roughly into bite-size pieces. 3. Pour 1 tsp. olive oil into a large skillet, and place over medium-high heat. Cook arugula for a minute or two until the leaves barely begin to wilt. Add the peas and prosciutto until heated through. 4. With the pan off the burner, add the pasta to the pan, and drizzle with remaining oil. Toss with lemon juice, salt, and pepper. 5. Before serving or packing for lunch, garnish with shaved cheese. 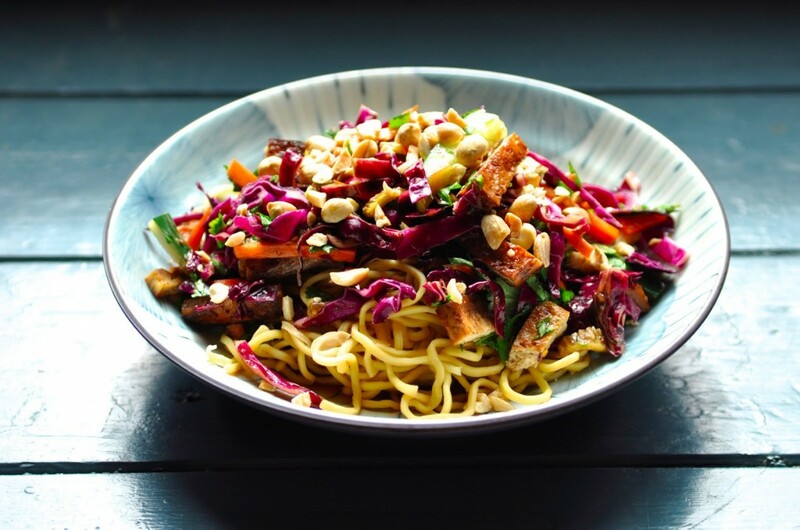 Although this delicious salad can be enjoyed immediately, when the noodles and tofu are slightly warm, it is best after the flavors marry in the fridge overnight – making it perfect for tomorrow’s lunch! Picky brown bag lunchers might feel the need to pack up the tofu, dressing, and salad separately, but that’s not worth the trouble with this recipe. 1. Preheat the oven to 350°F. Place the block of tofu on a baking sheet, and press it with a heavy pot or cast iron skillet to squeeze out the liquid. After 15 to 30 minutes, cube the tofu. 2. Mix up the marinade by whisking together the honey, soy sauce, single garlic clove, grated ginger root, and 2 Tbsp. rice vinegar. Add the tofu to the bowl, and let sit for 10 to 15 minutes. Shake off excess liquid as you remove the tofu to lay it on the baking sheet. Bake for 15 minutes, flip, and remove from the oven after another 15 minutes. Slice into thin strips. 3. To make the salad, boil water in a large pot, and cook the noodles according to the time on the box. As they soften, mix the rice vinegar, coconut sugar, soy sauce, garlic, and chili flakes in a small bowl. 4. Drain the noodles, and mix in a large bowl with the cabbage, carrots, and cucumber. Pour half the dressing over the top, and toss gently to coat. Top with baked tofu, fresh cilantro, and peanut pieces. What do you think of these healthy lunches for work? Have anything else to share? Let me know in the comments below! Muscle for Life Success: Kristina G.